Boa Viagem-Angra-Acore (Liga Feminina) landed 28-year old Guyanese international guard Miriam McKenzie (177-90, college: Loyola, MD). It is actually her comeback to Angra Heroismo as she has played here before. McKenzie has a double citizenship as she also holds American passport. McKenzie played most recently at Adelantados in Spanish LF2 league. The previous (16-17) season she played at AS Aris Thessalonikis (A1) in league where in 21 games she was third best scorer with impressive 19.6ppg and recorded 11.4rpg (#3 in the league), 3.3apg and 2.1spg. It was a very successful season in her career as she was awarded Eurobasket.com All-Greek League Co-Rookie of the Year, selected to 2nd Team and selected to All-Imports Team. McKenzie played in the final of Finnish League in 2013. 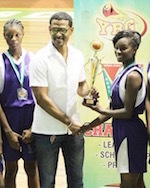 She also represented Guyana at the FIBA Caribbean Championship this year. 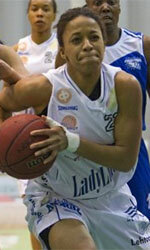 McKenzie has played also professionally in Finland (Peli Karhut). She attended Loyola College until 2012 and it will be her seventh season in pro basketball. President's College female team piped Marian Academy to championship honours when the V11 edition of the Titan Bowl Basketball Championship organized by Youth Basketball Guyana (YBG) concluded on Sunday last at the Cliff Anderson Sports Hall. The male segment of the competition was won by Mackenzie High School (MHS) which schooled Linden Technical Institute (LTI) in the final, 91-74. The female match saw President's College edging Marian Academy 24-23. Leading the charge for the winners were Annalisa Barclay who touched in 7 points while grabbing 5 rebounds, Roschelle Campbell supported with 6 points and a whopping 15 rebounds along with 3 steals. Despite the game high 19 points from Jada Mohan, who also grabbed 7 rebounds and 6 steals, Marian came up short when the time ran out on the clock. The male match-up, however, was by no means a close one as Mackenzie High blew away the challenge of their counterparts from LTI. In ripping form for the winners was Yannick Tappin who poured in the game high 44 points which was backed up by 6 assists and a similar amount of rebounds along with 8 steals. Kevlon Cadogan backed up with 14 points and 7 rebounds, while Leon Benjamin had 13 points with 11 rebounds. The top markers for LTI were Jamal Gilkes with 18 points and 15 rebounds, Dillon Pellew - 14 points and 10 rebounds, while George Yearwood had 13 points. The tournament was sponsored by Bounty Ltd., Department of Youth and Sports, Real Value Supermarket, Go Invest and Banks DIH.